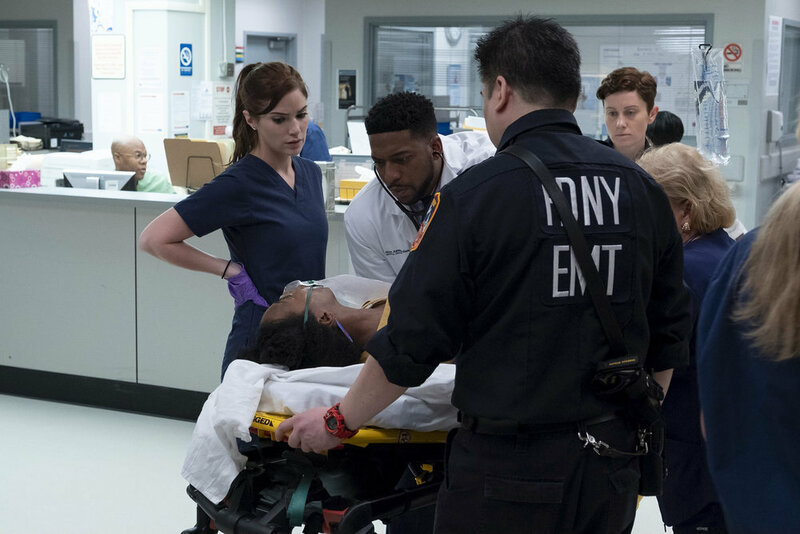 I’ve been waiting anxiously for Episode 2 of New Amsterdam ever since the final minutes of the Pilot. I have so many questions racing through my mind about how Dr. Max Goodwin is going to handle his cancer diagnosis and his duties to his wife, the hospital, and the doctors who expect him to lead them?!? Once again, New Amsterdam didn’t disappoint and should be THE must watch show on everyone’s list this Fall. Catch up on what happened in the Series Premiere last week with my recap and review here! On to tonight’s episode (BEWARE SPOILERS)! We open with a close up of Dr. Goodwin with a serious look on his face. It looks as if he might break as he struggles to find the words, telling his listener that they might not want to hear what he has to say. As the shot gets wider, we can see he is talking to his unborn child as he cracks a lame dad joke. It is obvious that Dr. Goodwin is infatuated with his unborn daughter as he sits there talking to her, eventually breaking out in song. While Dr. Goodwin is attempting to pamper his wife, he assures her that this time he will be different, that he won’t get sucked into the job. Georgia reminds him that even when he was physically there before, he wasn’t really there. When he is paged, she pleads for him to let her in, to really open up to her when he returns from his duties. It isn’t long though before Dr. Goodwin is rushing off to take care of hospital business. With his catchphrase “How can I help?” guiding him we see him attempting to tackle all the hospital needs at once. 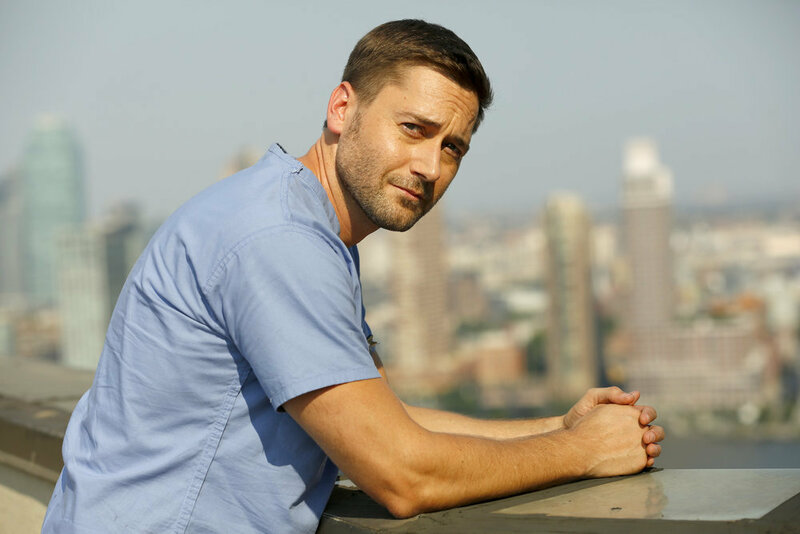 He is briskly walking the hallways with his doctors, providing solutions to their problems, talking with the janitorial staff about hospital cleanliness and how they might be the ones to save lives by noticing infection potential, and standing in front of a room of board directors laying out his plan to change the way New Amsterdam runs. 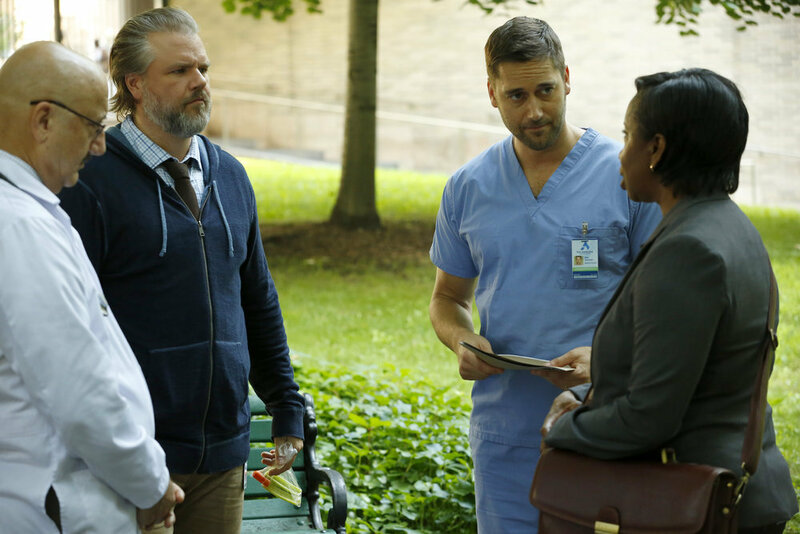 Dora (Zabryna Guevara) shows up to inform Dr. Goodwin that he can’t keep ignoring the Dean of Medicine who has been trying to get a hold of him. As he is creatively finding excuses as to why he isn’t calling his new boss, Dr. Sharpe appears to have a few choice words with Max. Apparently Max missed his appointment with her that morning because he was at a department chair meeting. It is obvious that Max does not want to talk about his cancer diagnosis and he doesn’t want anyone else to know what is going on with him either. He attempts to talk in code while in front of Dora and downplay the seriousness of his situation while Dr. Sharpe is trying to keep an eye on him and make sure he takes care of himself. I am quite fond of the way Dr. Sharpe has softened so quickly. She is taking the mother hen approach with Max and making sure that he takes care of himself so that he actually has a life to live. Towards the beginning of the episode, Dr. Frome excitedly shares the details of his daughter’s orange belt test to Dr. Kapoor. He then realizes that he never has asked Dr. Kapoor about his children, to which Dr. Kapoor informs him he doesn’t have any. Things turn to the discussion of how long Dr. Goodwin will last as medical director before the Dean of Medicine puts a kibosh on his antics. They are excited about what he is doing but know it can’t possibly last that long. During the final montage, Dr. Kapoor sneaks into a stairwell to make a phone call. As he leaves a voicemail, we discover it’s to his son. He apologizes for it being a long time since they talked. He asks his son to call him back and informs him that he is there. I wasn’t expecting a mystery son to pop up but I’m hopeful we will get to see this relationship become tangible throughout the season. Jozette’s Story. Our first patient case is Jozette, a young woman who collapsed accepting an award at a fundraiser. She has a valve in her heart that is broken causing blood to back up into her lungs. Jozette is an aid worker for the people of Haiti and is desperate to get to the people in the village of JeanRabel, who are suffering through the devastation left in the wake of a mudslide. She is so distraught by the situation that Dr. Bloom and Dr. Reynolds believe she has takatsubo syndrome. AKA broken heart syndrome. Dr. Reynolds needs to perform surgery to fix the damage from the tear but Jozette and her family want to perform a ritual before she goes under the knife. Her father asks if they could perform a “Gad Ko,” a protection ritual that involves making a cut in the skin and rubbing in some herbs. Dr. Reynolds is adamant that they will not perform the ritual because he doesn’t want to risk infection with an open wound, while Dr. Bloom believes he should let them perform it because Jozette believes it will protect her. Dr. Goodwin ends up receiving a call from Jozette’s family because Dr. Reynolds won’t let them perform the ritual. Dr. Goodwin explains to Dr. Reynolds that the patient believes the ritual will keep her safe from harm. Dr. Reynolds insists the he will not let someone cut into her except himself. When Dr. Goodwin confirms that he is just advising him on what to do and not forcing him to proceed in a specific manner, Dr. Reynolds reminds him of his decision and ends the conversation. Dr. Reynolds is ready to take Jozette to the operating room even though she never got to perform her ritual. As they start rolling her bed out of the room, she crashes. Completely losing her heart rate, they must defibrillate her to bring her back to life. Once she is stabilized he attempts to start moving her again only for Jozette to crash once more. Every time the wheels starts to move she becomes unstable. Dr. Reynolds has to place a pacing wire in Jozette in order to keep her stable enough to reach the OR. However, as soon as she is prepped for transfer her condition worsens. Dr. Bloom keeps nagging Dr. Reynolds to let her family perform the ritual, but he doesn’t concede. Dr. Reynolds finally caves in and allows her family to perform the Gad Ko. After her family finishes the ritual he starts to wheel her to the operating room and she is stable the whole way. Dr. Goodwin remarks that the ritual worked and Dr. Reynolds shoots back not to tell Dr. Bloom. 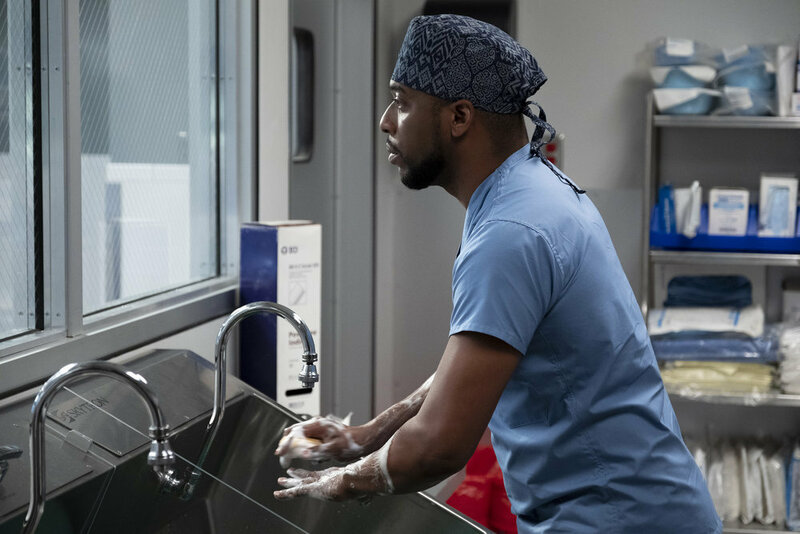 While Dr. Reynolds is scrubbing in for surgery he is speaking under his breath and scrubbing his hands in a particular manner. Dr. Bloom enters the scrub room to gloat that the ritual worked. She then points out that Dr. Goodwin has his own rituals. He has to scrub each finger 10 times and he always recites Invictus as he preps for surgery. He tries to explain that it is routine, but Dr. Bloom has the knowing look that it is indeed his own personal ritual. Dr Reynolds fixes Jozette’s heart in surgery and attempts to get it beating again, but it won’t start on its own. Dr. Reynolds goes the extra length in an attempt to revive her. The rest of the team is ready to call her time of death when he starts cardiac massage to get her heart going again and it works. When Dr. Reynolds goes to share with her family that surgery was a success he told them the Gad Ko worked. Leo’s Story. Leo is our second patient case of the episode. He is a grade school child who is heavily medicated with several psychotropic medications. Leo is a shell of a himself, who hardly speaks and doesn’t let anyone in. Leo’s mom informed Dr. Frome that he used to be energetic and silly, but they had to put him on medication for the outbursts he had at school. Dr. Frome wants to take Leo off all his medication to find the underlying reason for his behavioral problems. He is unable to figure out the root cause of Leo’s issues because he is so heavily medicated. Dr. Kapoor is there to assist Dr. Frome in safely taking Leo off the drugs. Together they list all the problems that Leo has suffered since starting his prescription regime; lethargy, apathy, sleeplessness, and weight gain which led to Type 2 diabetes. Later in the episode Dr. Goodwin introduces Dr. Frome and Dr. Kapoor to Dr. Elsie Villareal (Sandra Daley), the psychiatrist for all the public schools in Queens. She informs the men that if they attempt to detox Leo from his medicine that he will no longer be admitted to any New York public school. In court, Dr. Frome and Dr. Kapoor make an excellent case for Leo to be removed from his medicine. They argue that his medication is causing serious health problems and that they are unable to get to the root to his condition with all the medication. Dr. Kapoor points out that Dr. Villareal is in charge of more than 3,000 students and prescribing them medicine is easier than having to evaluate each student’s needs in depth. He doesn’t believe that we should have to choose between the physical and mental well-being of our children. When the New York school system has the floor to argue their position they show a video of Leo at school. In the video Leo has a confrontation with another kid and starts punching the kid with a never-ending rage. It looks like the tables have turned against Dr. Frome and Dr. Kapoor, as the evidence against removing Leo from his medication is pretty damning. 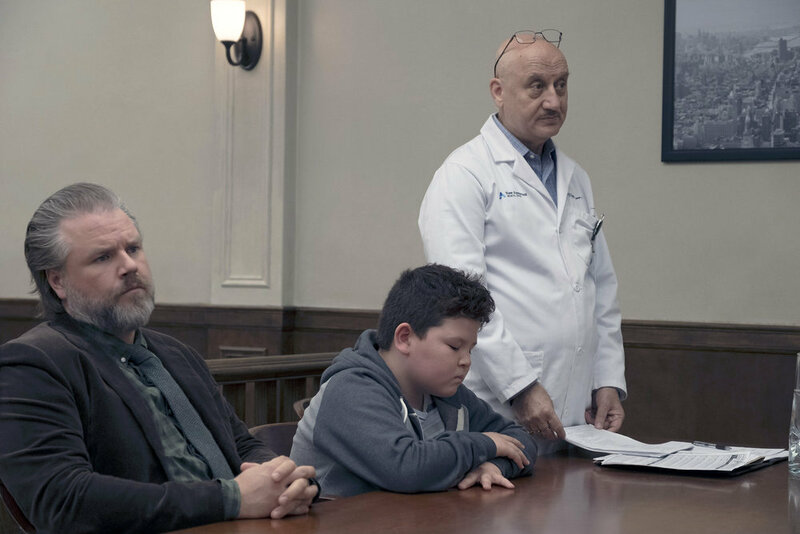 Dr. Kapoor has an idea that might help Dr. Frome get Leo to open up about what he was feeling the day he beat up the other kid at school. The two of them perform a rapid detox dialysis to quickly release the drugs from Leo’s system. Dr. Goodwin loses his cool for the first time as he lays into them for performing this procedure while they are in the middle of court proceedings. Dr. Kapoor points out that Dr. Goodwin should be expecting a visit from the Dean of Medicine soon and that is why he is more concerned about the potential liability of the hospital than the patient. 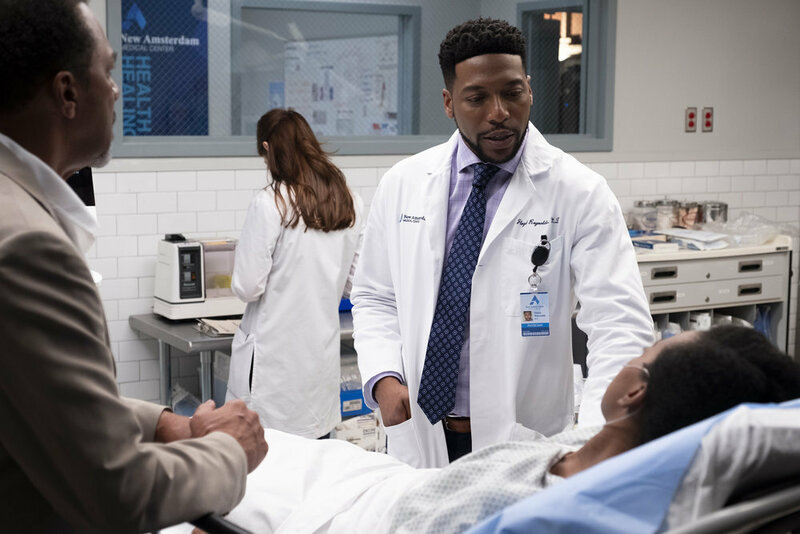 During this conversation, Dora approaches them to inform Dr. Goodwin that he is needed in hematology and he needs to call Dr. Sharpe’s office. Dr. Goodwin looks overwhelmed as he leaves the two of them behind in his dust as he escapes to the roof. When court is resumed Leo is on the stand and tells the Judge what he told Dr. Frome earlier. Leo finally opens up and says that it’s his fault that his father died. They were going to Sheeps Meadow to build Legos one day and Leo forgot the Legos at home. His dad went back to get them but because of asthma and a heart condition he had a heart attack when he reached the top of their 5th story walk up. Leo was the one who found him. Leo explained what happened the day of the video they played in court earlier. Another boy kept telling Leo that he should be dead like his dad. He decided he finally had to make it stop and that was why he beat up the other boy. Dr. Frome suggests that they have Leo talk with him and work through his displaced guilt. He advises that the medication will keep him from being able to process everything that has happened. The judge agrees and Leo will finally be removed from his plethora of medication. Moving back to Dr. Sharpe, we get to see her softer side when she talks with her patient, Millie. Millie jokes that she would have done her nails if she knew she was meeting the real Dr. Helen. Helen reminds her that she looks fine to which Millie rebuttals that none of her looks fine. As Millie pours her heart out about the struggles of chemotherapy and cancer, Dr. Sharpe starts to get emotional. She abruptly gets up from her desk as her eyes start to water and beelines for the room next door, hiding just inside as she tries to calm herself down. This emotional version of Dr. Sharpe is the exact opposite of the face she presents to the world. It brings a humanity to the “always in control, have to have it my way” version we’ve seen from her so far. 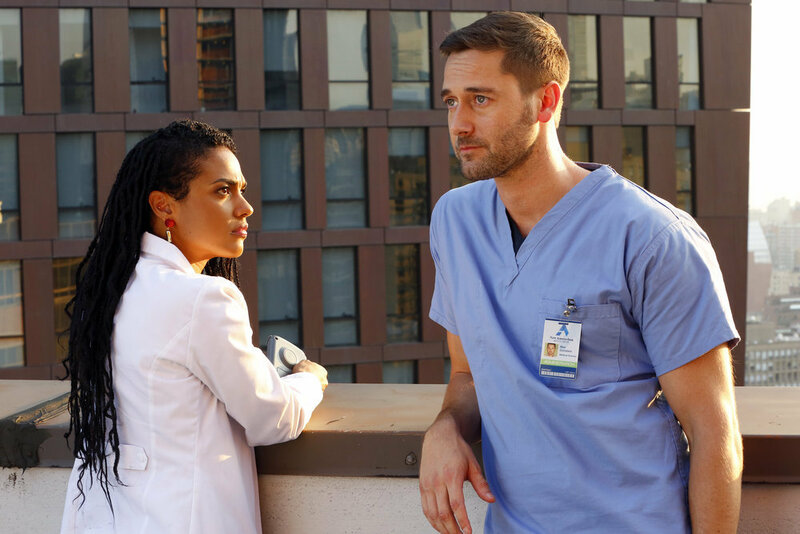 When Dr. Goodwin makes it to the roof, Dr. Sharpe is already there because she is also looking for an escape after her emotional day with her patients. Dr. Goodwin opens up about the promise he made to wife about slowing down. Before his position at New Amsterdam, Dr. Goodwin ran a clinic in Chinatown, and it almost broke them. He promised her that she wouldn’t have to go through that again. They wanted to start a family, so he asked Georgia if she would stop dancing, so they could slow down and become parents. She agreed. 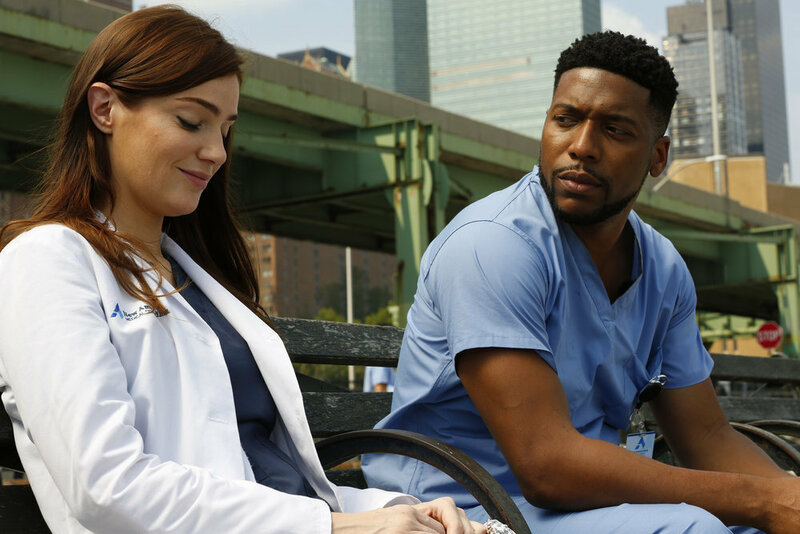 After they got pregnant he got the call for the position at New Amsterdam and he took it without even discussing it with her. Max reveals that he hasn’t told Georgia about his cancer and Dr. Sharpe informs him that he can’t carry the load on himself. Just before Dr. Goodwin is about to walk into his wife’s hospital room and tell her he has cancer, her doctor stops him. She informs Dr. Goodwin that for the sake of his unborn daughter and wife, she cannot be put under any stress, physical or emotional. When he enters the room, he makes the decision not to inform her he is sick. Georgia asks him to let her in, to tell her one true thing but all he can muster up is that he loves her. He looks devastated as he keeps the truth hidden and Georgia is visibly upset that he is keeping his walls up. The rift that is growing between them is getting more obvious and it looks like we will hit several bumps in the road before we find any resolution. The relationship between Dr. Frome and Dr. Kapoor plays out so well on TV. I feel like they are brothers or best friends. The way they worked on this case together was beautiful written and portrayed with excellence. They are definitely a duo that is fun to watch. Dr. Reynolds had the biggest lesson of the episode. It’s kinda funny how we often don’t believe in other people’s rituals but we hold our own in high regards. Dr. Reynolds learned how a patient’s mental preparedness is just as important as his own medical skills when it comes to a successful procedure. I feel that the growth rate for Dr. Reynolds is much higher than anyone else in the series and it might pay off for him in the future. I can’t wait until we dive a little more into Dr. Bloom’s character. She has a fierceness that has gotten her places, but I believe it will also get her into hot water as well. I loved how she played devil’s advocate to Dr. Reynolds but wonder if she would handle it so well if the roles were reversed. Things are definitely heating up at New Amsterdam and it’s only a matter of time until something blows up. The only question now, is who will be left standing in the aftermath?